This is final part in our series of articles taking a deeper look at the blaster statistics available in the iSoaker.com database. Read up on Part 1, Part 2, Part 3, and Part 4 if you haven't done so already to get more background on the insights presented below. In this final part, we'll take a look at changes to stock water blasters over time. While the oldest known water gun is currently pegged at 1896, the oldest item in the iSoaker.com Database is the Cosmic Liquidator (~1977). Beyond that, we only have a sampling of water blasters available in the 1980s-1990, thus to stick to where we have the most information, our exploration will look only at water blasters made after 1990. As noted, we are only looking at water blasters that we have statistics on. Thus, there are a lot of other stock water guns and water blasters that we do not have statistics on. However, the information we have amassed over the years from the major stock water blaster manufacturers offers some interesting insights nevertheless, at least in terms of how various product lines have developed over the years. Needing to start somewhere, we will begin by looking at how some of the physical characteristics of water blasters have changed over time. Looking at the Super Soaker and Water Warriors brands, there seems to have always been a good selection when it comes to water blaster lengths. There are some notable years (e.g. 1996, 1998, and 2000) when particularly long water blasters were released as well as other years (e.g. 1992, 1993, and 2004) when shorter items were released. It is interesting to note that the Water Warriors brand seems to have capped its maximum length at ~60cm while the Super Soaker brand (now Nerf Super Soaker) still makes some longer models (though these longer lengths are increased often to the additional of swappable parts). Perhaps a little more revealing is how water blaster dry weights have changed over the years. In this case, there appears to be a more defined peak in the year 2000 with points leveling off in the more recent years. The current preferred maximum dry weight seems to be around 1500g. Other than that, as with lengths, each year seems to have a good variety of water blasters at a number of weight levels. This is, of course, no definitive means to forecast what the future holds, but if trends continue, we're not likely going to see a particularly heavy stock water blaster models in the foreseeable future. Beyond physical statistics, many wonder how water blaster performance has changed over the years. 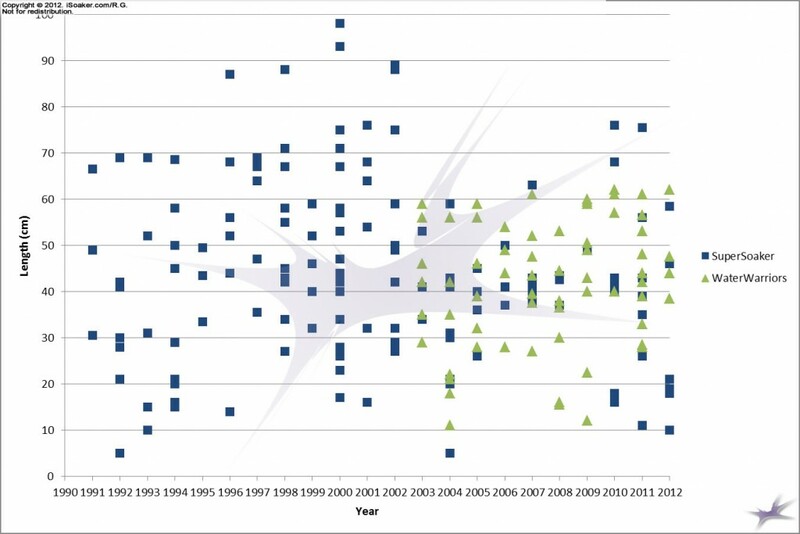 The following plots nozzle ranges versus year. 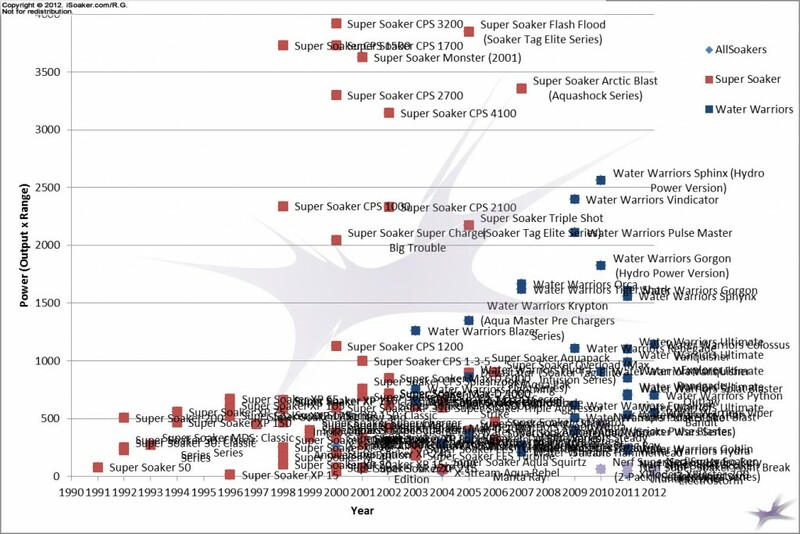 As the graph above shows, most water blasters achieve a range of 8m to 10m with things capped off at 15m for the Super Soaker CPS 2000. (Note: points falling on the x-axis are from water blasters that did not have their range measured, not from water blasters that have ranges of 0). However, looking a little more closely at particular brands and lines, some trends are revealed. Not surprisingly to most, the Super Soaker CPS-series tend to push streams farther (the points that appear low are from fan-blast settings from some models' nozzle selectors). What was a little more surprising is how well the Water Warriors brand seems to perform with their models being at the top of the range scale for most of the years they have been produced. Moreover, the Nerf Super Soaker models fall at the other side of the spectrum, having ranges near to the bottom of their years of production. This graph is similar to the last one, but only shows the maximum ranges for a particular water blaster model. 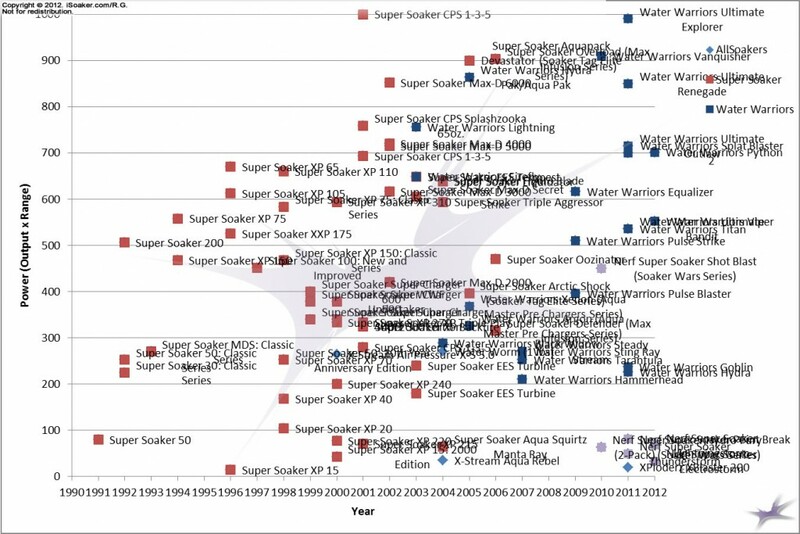 As can be seen, the Super Soaker CPS series and the Water Warriors line tend to occupy top spots in their years of production while the Nerf Super Soaker line tends to be on the lower end of the range scale for its models. But How Well Do They Work? While range of a water blaster is important to many, the true soaking power is perhaps better captured by its power. For iSoaker.com, a water blaster's power is defined as range multiplied by output (see: the iSoaker.com Statistics page for a more complete explanation). The above graph plots only the maximum calculated power level for a given water blaster model. 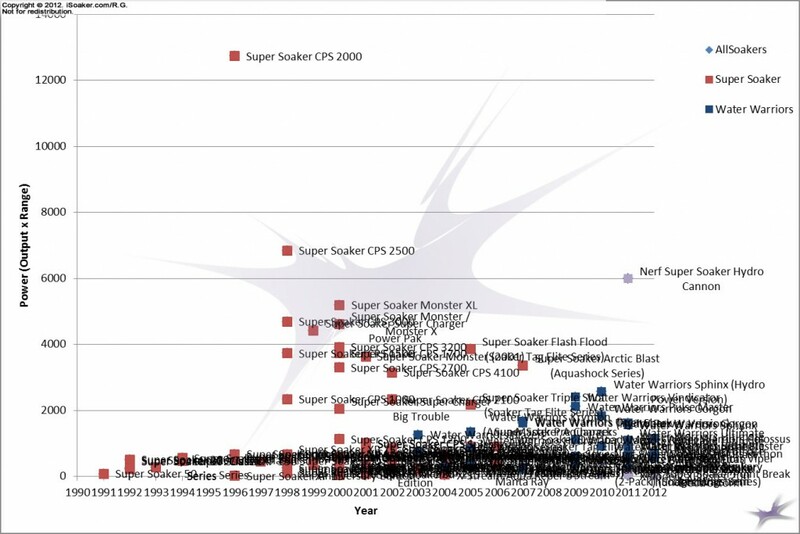 What becomes immediately obvious from this graph are a couple of things: the Super Soaker CPS 2000 (1996) is by far the more powerful stock water blaster made to date and that the general trend in power peaked in 1996 and has tapered off in recent years. 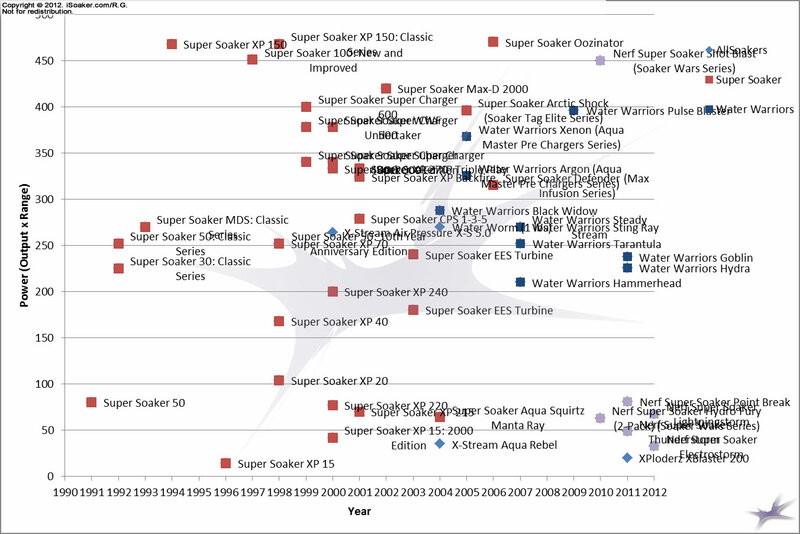 There is one blip in 2011 with the release of the Nerf Super Soaker Hydro Cannon. As can also be seen on the chart, CPS-technology-based water blasters occupy all the top most points when it comes to power. The fact the pressure from a CPS chamber remains constant for the duration of the shot undeniably raises the overall power those water blaster models are able to generate. Below are zoomed regions from the above plot to make it easier to see where some water blaster models fall on the chart. Looking at some other trends for particular lines, we get the following insights. The Water Warriors brand was increasing over the years in terms of power until the injunction in 2010 (its Hydro-Power-based water blasters occupying the top points). Water Warriors-brand blasters from 2011, being restricted to air-pressure-only, seem to be maxing out what is possible to do with stock air pressure systems. On the other hand, apart from the Nerf Super Soaker Hydro Cannon, the remainder of the Nerf Super Soaker series all fall below the 500-point level for power with the majority falling below 100 (less power than that of a Super Soaker XP 20). Simply put, the motors used for the newer Nerf Super Soaker models perform so much lower than even small air-pressure systems. This fact is why the original Super Soaker 50 managed to dominate and pretty much end the reign of motorized water guns back in the early 1990s. This is also why it is odd, perhaps ironic, that the Nerf Super Soaker line is making so much use of a technology that is unquestionably inferior to air-pressure, let alone CPS-tech systems. 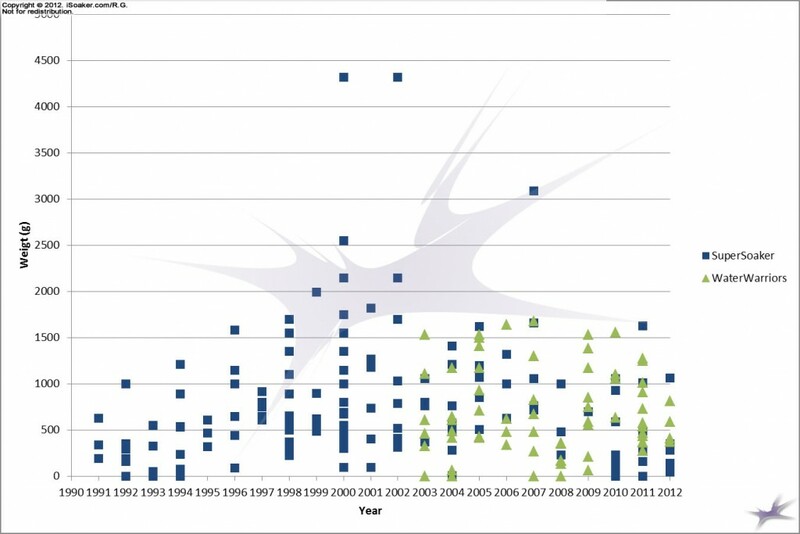 It's been a long time coming, but taking a look how stock water blaster statistics relate and have changed over time is quite revealing. 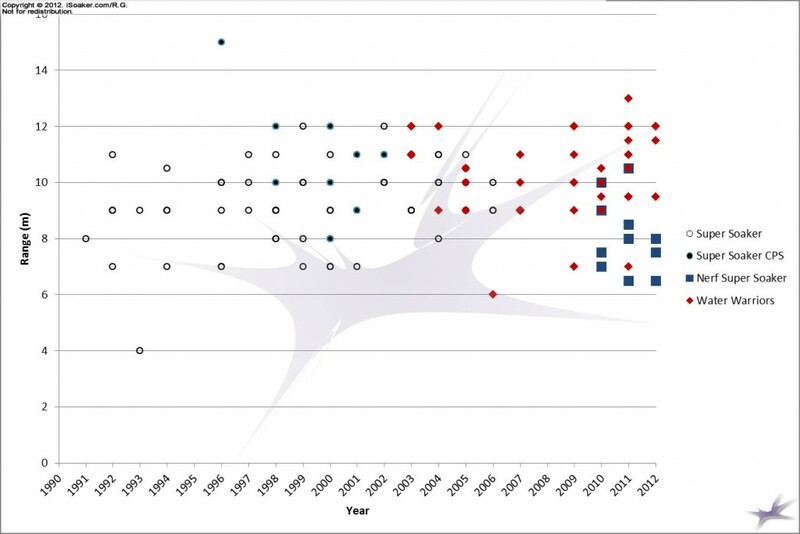 While these statistics alone cannot definitely predict what future water blaster models will do, general trends do offer some indication on where performance will likely be in the near future. While not surprising to most, the true dominance of CPS-based technology when it comes to water blaster performance is shown again and again in the various graphs. Here's to hoping that the Water Warriors brand will continue to try to push the upper boundary of its limitation in the air-pressure realm for now. As for the Nerf Super Soaker brand, here's to hoping that they will again start making use of the CPS-technology they have opted to lock down to themselves for the duration of their patents. As they had shown they can do with the Nerf Super Soaker Hydro Cannon, they should really make more water blasters using CPS-tech, but preferably having more controlled, laminated streams. While they can continue to make some motorized water blasters if they so choose, developing more air-pressure and CPS-tech-based blasters would go a long way into putting the "Super" back into the Nerf Super Soaker brand. As for other manufacturers, the choice for water blaster performance is clear; unless you can license the use of CPS-tech from Hasbro Inc., air pressure systems provide the most soaking power.